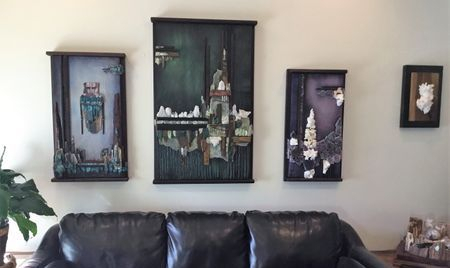 My media is mixed media used in wall art and jewelry. I began making things as a child growing up in Venezuela. There were no toy stores, so I would create things to play with for myself and my friends. Lots of gadgets and even bedroom areas converted into space ships, cavalry forts , submarines, medieval castles.... with all the stuff needed to be in the spaces of course. After moving back to the U. S. I made some beaded and leather necklaces to sell in school. Extra snack money in junior high. Later, while finding nothing career oriented in a couple of colleges ! I encountered some people making leather sandals in Palm Springs Calif. during an Easter break. That was it! I immediately began to do leather-work. Sandals, handbags, belts etc. Sold them at a beach in California out of my old panel truck. Then a little leather shop in the back of a local nightclub. Then learning silversmithing and stone cutting I began to make items inspired by designs used in Native American Art. Started going to Indian Markets and showing in galleries that focused on art of the American southwest. 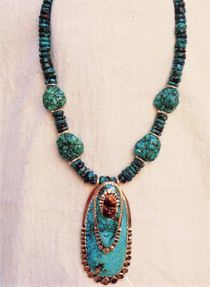 The work evolved , and I started making wall art and jewelry instead of fashion items. Today my work is wall art and jewelry... mostly. I use stone and wood primarily on painted textured backgrounds to create the wall art. 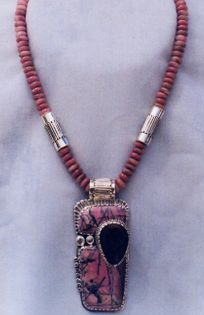 I use silver, stone, gold, and copper in my jewelry. The process.... I love it. Begin with an inspiration....an idea...a rock...a piece of intriguing wood....or anything that starts it. Then the journey....working the materials....creating a balanced vision with them...and finally the nuts and bolts of fabricating a finished piece. A journey I feel blessed to be able to travel. Thank you......May you walk in balance, and experience harmony!